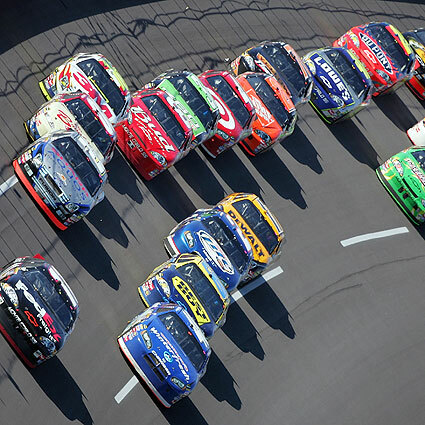 There are just four races left in the 2012 Chase for the Sprint Cup, the “playoffs” of NASCAR’s top series. The 10-race Chase is made up of 12 drivers: the top ten in points and the two drivers outside of the top ten with the most wins. As the chase winds down, only four drivers realistically have a shot left to win the championship: Brad Keselowski (points leader), Jimmie Johnson (-7 points), Denny Hamlin (-20), and Clint Bowyer (-25). Outside of this weekend’s race at the short track in Martinsville, VA, the remaining races take place on intermediate-length tracks that are guaranteed to be boring and predictable. To save you the agony of watching 1400 bland miles of circles to finish the season, I’m going to tell you how the points will shake out, and who will be raising the hardware at Homestead-Miami Speedway on November 18. Hamlin has five wins this year, tied for most on the circuit with Keselowski. I’m not impressed. Two years ago, Hamlin almost had the championship won, but miscalculated his fuel mileage at Phoenix in the penultimate Chase race. This error gave the championship lead to Johnson, who didn’t look back at Homestead as he won his fifth straight championship. Since then, he hasn’t been able to put all the pieces together to contend for another. While he’s only 20 points back, he hasn’t put up any memorable performances in the Chase outside of winning at Loudon, and sitting at third in points has to be the most 'quietly good' year he's ever had. Maybe it’s because I don’t care for Hamlin, but I just don’t see him grabbing the bull by the horns and winning the necessary race or two to take the title. The pride of Emporia, KS has had a great first year behind the seat of the 15 car, winning three races and finding himself on the fringe of the title hunt. Two weeks ago, with virtual elimination staring him in the face, he gambled on fuel mileage and won the Bank of America 500 at Charlotte, running out of gas as he celebrated with donuts. He followed that up with a sixth place finish at his home track in Kansas, positioning himself 25 points back of Keselowski. 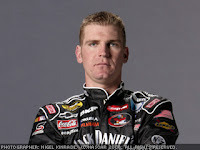 While he has made an admirable charge, it would take a large hiccup by the other three drivers to hand Bowyer the title. He’s been running well in the chase outside of the 23rd-place finish at Talladega, and there’s no reason that should change. But “running well" isn’t good enough to get him the cup. I think he passes Hamlin for third place, but this championship fight is going to be a two-man show. This is a tough call since Keselowski has been the most dominant driver this year. He’s won five races, finished in the top-5 12 times, and has 20 top-10’s. Last week at Kansas, he avoided disaster when he dodged a wreck that would have put him out of the race and dropped him significantly in the points. Part of my bet against Keselowski is fuel mileage. His Dodge has never been known to get the best mileage in the garage, which we saw two weeks ago at Charlotte when he was forced to pit in the closing stages of the race while Bowyer and Johnson stretched. He’s also never been this close before, and the jitters are bound to set in. In 2010, Denny Hamlin was in the driver’s seat (no pun intended) to win his first cup before running out of gas at Phoenix. Last year, Carl Edwards held the points lead for most of the season until then two-time champ Tony Stewart proclaimed that Carl should be worried, ultimately ending in Stewart passing Edwards to win Homestead and the cup by a single point in arguably the most exciting NASCAR race in history. As Keselowski falters, look for another driver to channel his inner Mariano Rivera and take home another trophy. 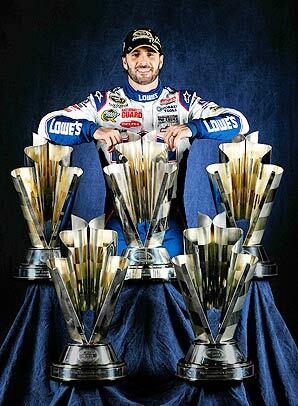 “Five-time” is in the best position to take home what would be his sixth championship. Like Keselowski, he avoided disaster at Kansas last week when his crew miraculously fixed his car after he spun and backed into the wall. He salvaged a top ten finish, a remarkable feat given the circumstances. His reward? The series turns to Martinsville, where Johnson is a 6-time winner and carries an average finish of 5.8, much better than Keselowski’s 13.4. Johnson also gets Phoenix, where he is a 4-time winner. I think these two races make the difference in the Chase, vaulting Johnson to the top of the standings and to the top of the championship podium in 2012.